During this FREE, family fun evening at Florida Maritime Museum, experience “Old Florida” through the lens of Florida’s maritime history! Bring your family for a festive photo op and a visit with our Santa Fisherman, Nathan Meschelle. 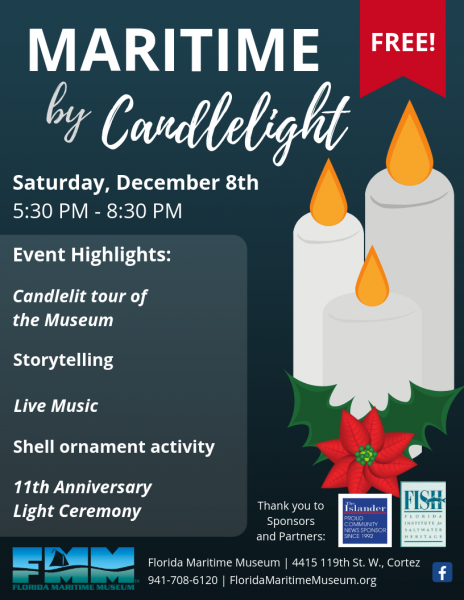 There will also be a candlelit tour of the museum, storytelling with Folk School instructor Carol Mahler, live music, a shell ornament activity with Folk School instructor, JoAnn Mancuso, and a special 11th anniversary maritime-themed light ceremony. Festivities begin at 5:30 and will last until 8:30 p.m.
Food and beverages will be available on site, including Craw-fish Mac & Cheese from Seafood Shack as well as cider from The Ferment Lady! Thank you to our sponsor, the Islander Newspaper, and to our partner, Florida Institute for Saltwater Heritage (F.I.S.H. ).